Orson Welles was an American director, writer, actor and producer for film, stage, radio and television. A crossword that Lisa once completed featured the clue: "Yul Brynner died the same day as ___ Welles (odd fact)". The documentary Nostradamus: The Man Who Saw the Future was hosted by Orson Welles. Welles spoke about the predictions of Nostradamus and how they had all come true, except one, which spoke of World War III. Later, Mr. Burns had a dream where Orson Welles, who was in Heaven, asked him if he had taken his warning seriously. Welles then told Burns that God had comissioned him to direct a rainbow and he had spent half his budget on indigo so he must be red himself. 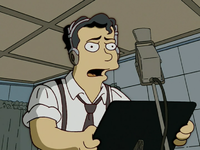 The citizens of Springfield circa 1938 heard Welles' infamous War of the Worlds broadcast. Thinking it to be a real invasion, they began rioting and destroyed the town. Lisa notified the citizens that it was all a hoax and, angry at being fooled, the citizens of Springfield vowed to not fall for such a trick again. Kang and Kodos decided this is the perfect time for a real invasion, and began destroying what was left of the town. True to their word, the town did not believe that it is a real invasion and ignored it, even though Welles came to Springfield, admitted that it is not a staged act, and begged them to do something. Unfortunately, they did not, and three years later Kang and Kodos are overlooking the ruins, mulling on what went wrong and why they weren't greeted as liberators as they rid Earth of weapons of mass disintegration during "Operation Enduring Occupation". Modified on July 1, 2018, at 19:17.